New books shipping Jan 28! Two more of Random House’s reissues of Ruth Chew’s books are about to be available. 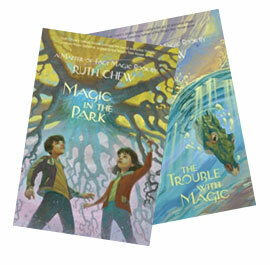 Next to be released in paper-and-ink copies (hardcover and paperback and library hardcover) are The Trouble with Magic and Magic in the Park. Released as an e-book omnibus are The Wishing Tree, The Magic Coin, and The Magic Cave, collectively titled Three Wishing Tales.